GLOVO ushered in the New Year with new hope to expanding its projects and programmes and to renewing its contract agreements with its developmental partners. During the last quarter of 2012, much was done but we were unable to furnish you with news. We carried out our usual child support, child monitoring, and volunteering service and programmes. However, the annual end of year party for GLOVO children was not organized due to lack of funding. In January 2013, the Directors of GLOVO thought it wise to acquire extra land for future expansion hence the acquisition of another one acre land meant for GLOVO projects. We wish to extend our invitation to all lovers and donors to come and support the construction of the GLOVO village which is still under construction. A lot of constructional works are underway at the GLOVO village. 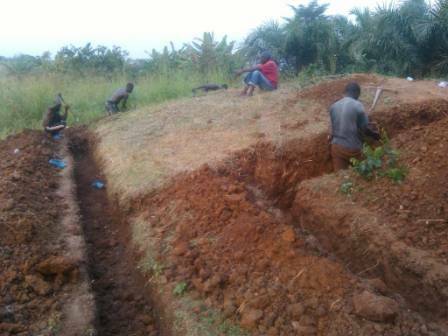 A foundation for a clinic to serve the village and the three surrounding communities has been dug. Start-up funding came from an American philanthropist however we still seek support from you too to enable us build the clinic to provide health services to humanity in deprived communities. With support from Dr. Carmen Ferber from Canada and Larissa Da Costa, a volunteer from Brazil, a third classroom has been built, roofed and cemented and is now ready to be used. Still on classrooms at the village, GLOVO-Germany has started the construction of a four-classroom block to enhance teaching and learning. Since management of GLOVO wishes to move the pre-school to the new site in September this year, the commencement of the project by GLOVO –Germany came at the right time when funding had become a problem. The toilet facilities and other washrooms are half complete but funding has become a challenge now. In a similar vein, the mechanisized well which is hoped to supply drinking water to the entire village when completed has stagnated due to lack of funding. Meanwhile the Stage One and Two pupils of the Academy are schooling there but find it difficult to get potable water for drinking and other domestic chores. We therefore wish to use this medium to make this passionate appeal to donors, past Glovo volunteers, organizations, churches, schools and individuals to come to our aid to ensure early completion of these numerous projects. Happily, our volunteering service is growing from grace to grace. We are poised to receiving more volunteers this year. Kultur-Life, our solid volunteering partner, has worked tremendously to ensure that we receive short term volunteers from time to time. Kudos, for the excellent work. 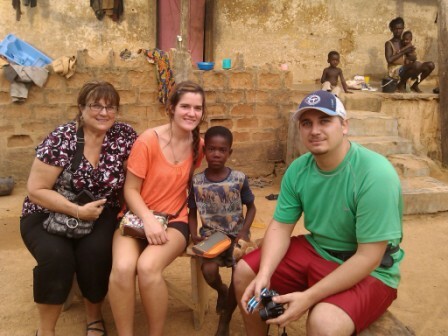 Flora and Henrike arrived on February 1, 2013 to begin their volunteering service in Ghana. We hope to receive more volunteers this year so that we can expand our project areas to other parts of Ghana. YOU WILL NOT REGRET SUPPORTING GLOVO PROJECT IN GHANA. The Glovo Academy is also growing steadily though with some challenges such as staff salaries, transportation and feeding of pupils, poor parental attitude and the likes. That aside, enrolment is better as compared to last year and we hope that when good infrastructure, playing equipment and teacher motivation are in place, Glovo Academy will soar higher. Please kindly click the link below to view our latest view on youtube. We wish you well and believe you will respond positively to our passionate appeal. As a way of strengthening the bond of co-operation that exists between Morningstar- Canada and GLOVO- Ghana and further renewing the partnership agreement between these two organizations, the Executive Director of Morningstar Family Ministries visited Ghana for the third time in November and left for Canada on December 3, 2012. She had a bilateral discussion with the executive Board of Glovo. As part of her itinerary, she visited the Glovo Academy and took part in the school`s Parent-Teacher Association meeting where she pledged to support the school. 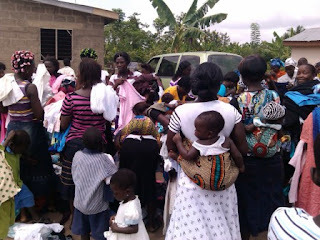 She later donated clothing and assorted household effects to the teeming parents who attended the meeting. Earlier, she donated clothing and other items to some poor rural communities dotted around the Swedru municipality. All was joy, thanksgiving and appreciation. She later witnessed a football match between Glovo Academy and Oteiprow Basic School. On 14th December 2012, Management of Glovo and all workers at Glovo Academy visited Asifaw, a farming community in the Eastern Region and made a huge donation of items worth thousands of Ghana Cedis. The items included clothing, footwear, educational materials, toys and medication. This is the second time Glovo has come to the aid of that deprived community. It will be recalled that Glovo registered more than one hundred children in the village under the National Health Insurance Scheme. Children who were hitherto not healthy can now access medical care free of charge. After the donation the school staff visited the wondrous umbrella rock at Asifaw which is the biggest in Africa. In fact it was a thrilling experience for all. Staff of Glovo Academy under the Umbrella rock at Asifaw. The school project is progressing steadily and within a period of just one year enrolment has increased to more than 140 pupils. This is spectacular but we are not complacent in our efforts. We are planning to move the entire school from the old site to the new side. This brings in its wake a huge financial challenge which Glovo cannot bear alone. It is against this backdrop that we call on charitable individuals, families, schools and organizations to partner our effort to make this dream a reality. In a similar vein a huge sign post has been erected on the Glovo village site to inform our cherished and prospective donors that the Glovo village project is neither a mirage nor fiasco. With your support we are determined to impact positively on the lives of the people in those communities. We hope to make the village a centre of excellence as far as education, health, social work and recreation are concerned. We need funding to ensure a successful completion of the village. Our volunteering partnership with Kultur-Life has been strengthened and the project is growing from grace to grace. However we wish to expand our corridors to working in other regions in Ghana hence our call for more volunteers from other organizations abroad. As I write this article Larissa, a volunteer from Brazil, has just arrived to work for Glovo at Swedru Government Hospital for 8 weeks. She was posted here through Partnering organization, AISEC. Volunteering in Glovo is more fulfilling, rewarding and enterprising due to our well defined policies governing the conduct, work and accommodation of all volunteers. On behalf of Glovo executive board, workers and children of Glovo we wish you a happy Christmas and a prosperous New Year. 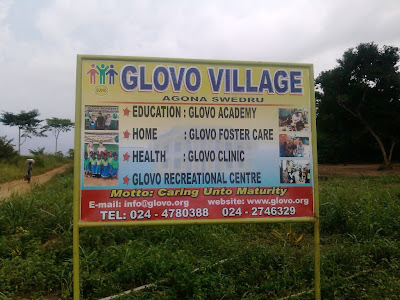 It is exactly a year now when GLOVO Academy was established, with the aim of providing quality but affordable education to orphaned, disabled and vulnerable children in deprived communities around the Agona Swedru Municipality. The first academic year ended on a happy note when we recorded a total enrolment of 120 pupils. This is unprecedented. Through thick and thin, Management of the school worked tirelessly to provide a new classroom block to accommodate pupils in stages one and two since the wooden structure constructed on the rented land is congested. Throughout the long vacation, Management worked feverishly to ensure that two classrooms were ready for use when school resumed on 11th September, 2012. Amazingly, that dream came to pass and now those classes mentioned have a place to study though there are still challenges we are grappling with. The school project is the genesis of the GLOVO Village. As you might have been hinted earlier, the Village will consist of school complex, a clinic, an ICT centre, a Counseling centre, Foster Home and a recreational centre when complete and is geared towards bettering the lots of disadvantaged people especially children in those deprived communities within the Agona Swedru Municipality and its environs. Now that work on the new land has begun, we welcome individuals, corporate bodies, families, churches and philanthropists to come on board to support this laudable project aimed at providing education, health care, shelter, recreation and counseling among others, to orphans, less privileged children and the society in general. Blocks and buildings will be named indelibly after charitable individuals and organizations that will provide funding for those projects. As part of measures to improve the livelihood of people in rural communities within the Agona Swedru Municipality in Ghana, we have once again received a consignment of goods from our Canadian partners Morningstar Family Ministry. The items include some mattresses and chairs, household effects, educational materials, toys, medical supplies among others. Distribution of the items to GLOVO children and some poor families in rural areas is yet to commence. We are grateful to all donors and ask ample blessings for them. Our volunteering project is growing steadily and people all over the world wish to witness the mouth watering projects GLOVO is carrying out in Ghana. Our projects are well defined; our care for volunteers is superb and our host family system is one of the best you can ever get. This platform is used to commend good effort of our partner volunteering organization Kultur-Life in Germany. Kultur- Life had made great differences in volunteering services in Ghana. We welcome volunteers from all walks of life and show them the fantastic Ghanaian hospitality and culture, in the course of the cultural exchange internship programme. To the past volunteers, we say well done and we hope you will strive hard to raise support voluntarily to support Glovo projects. To the new volunteers, we say ‘AKWAABA’ meaning welcome to Ghana and the GLOVO family. Let your stay be a blessing to many people in the GLOVO family especially the GLOVO kids. GLOVO Academy! The future looks Brighter! !